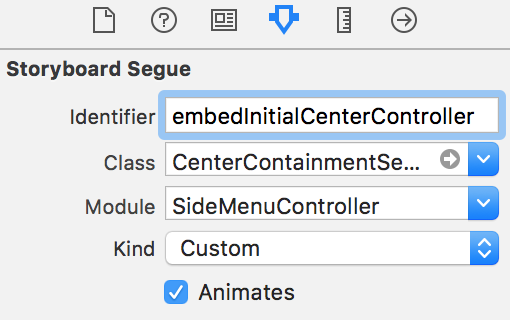 SideMenuController is a custom container view controller written in Swift which will display the main content within a center panel and the secondary content (option menu, navigation menu, etc.) within a side panel when triggered. The side panel can be displayed either on the left or on the right side, under or over the center panel. [CocoaPods] is a dependency manager for Cocoa projects. [Carthage] is a decentralized dependency manager that builds your dependencies and provides you with binary frameworks. Run carthage update to build the framework and drag the built SideMenuController.framework into your Xcode project. If you prefer not to use either of the aforementioned dependency managers, you can integrate sources in the Source folder into your project manually. 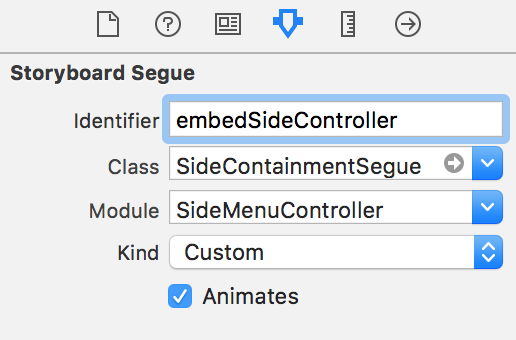 Next, go to the Storyboard, and change the class of the SideMenuController to the custom subclass you just created. SideMenuController can be used with storyboard segues, or you can programmatically transition to a new center view controller. In the storyboard file, add initially two segues from the SideMenuController scene, one for the center view controller, and another for the side menu view controller. Later on, you can add more CenterContainmentSeuges depending on how many scenes you want to transition to. Important Note: In case you want the center view controller to be of different type than UINavigationController, you'll have to add the menu button to one/all of its children navigation controllers programmatically. SideMenuController defines an extension to UINavigationController in order to make it easy to do that. Just call navigationController.addSideMenuButton(). Before calling that method, make sure the navigation controller is already embedded inside the SideMenuController's child controller hierarchy. You're almost set now. Last step is to know how to transition to new center view controllers. Important Note: SideMenuController defines an extension to UIViewController in order to make it more accessible via the computed property public var sideMenuController: SideMenuController?. From any UIViewController instance, you can access the SideMenuController by typing: self.sideMenuController. This will return the SideMenuController if the caller is one of its child view controllers or otherwise nil. SideMenuController offers you the possibility to cache center view controllers instead of always instantiating new ones when changing them. To transition to a new center view controller and cache it, call embed(centerViewController:, cacheIdentifier:) on the SideMenuController. To retrieve a cached center view controller based on a cache identifier, call viewController(forCacheIdentifier:) on the SideMenuController. For a more detailed example, check the Example project. Drawing - encapsulates custom attributes specifying how SideMenuController will adjust its layout, positioning on screen. Animating - encapsulates custom attributes specifying which animations will be used for different components. menuButtonImage In case this attribute is set, SideMenuController will add a button on the left or right side of the navigation bar of the center view controller (in case it is a subclass of UINavigationController) in order to trigger the slide animation. If the attribute is missing, or the center view controller is not a subclass of UINavigationController, you'll have to add the menu button by yourself to all the UINavigationControllers that will be embedded. sidePanelWidth The width of the side panel. centerPanelOverlayColor When the side panel is either .overCenterPanelLeft or .overCenterPanelRight, an overlay will be shown on top of the center panel when the side is revealed. Pass the preferred color of this overlay. centerPanelShadow When the side panel is either .underCenterPanelRight or .underCenterPanelLeft you can opt in or out to draw a side shadow for the center panel. + .horizontalPan: the status bar will slide along with the center panel horizontally. transitionAnimator TransitionAnimatable subtype which defines how the new center view controller will be animated on screen. panningEnabled Default value is true When the side panel is positioned under the center panel, the panning is recognized on the center panel. When the side panel is positoned over the center panel, the panning is recognized on the side panel. swipingEnabled Default value is true There is no swipe gesture recognizer instantiated when the side panel is positioned under the center panel. When the side panel is positioned over the center panel, the swipe is going to recognized on the center panel. menuButtonAccessibilityIdentifier Accessibility identifier to be set on the menu button. For more examples, check TransitionAnimator.swift. Toggles the side pannel visible or not. public func viewController(forCacheIdentifier identifier: String) -> UIViewController? Embeds a new center controller. centerViewController UIViewController use to access the currently embedded center view controller. sideViewController UIViewController use to access the currently embedded side view controller. delegate SideMenuControllerDelegate use to set the delegate to be notified about certain events. In order to receive the aforementioned callbacks, simply assign the delegate property to the SideMenuController instance.